During the release of Hasbro’s 3.75″ Indiana Jones figures, many collectors on the Indiana Jones forum discussed about recreating the scenes from the Indy movies, and among them include Indiana Jones’ elephant ride to Pankot Palace, a scene from “Indiana Jones and the Temple of Doom”. 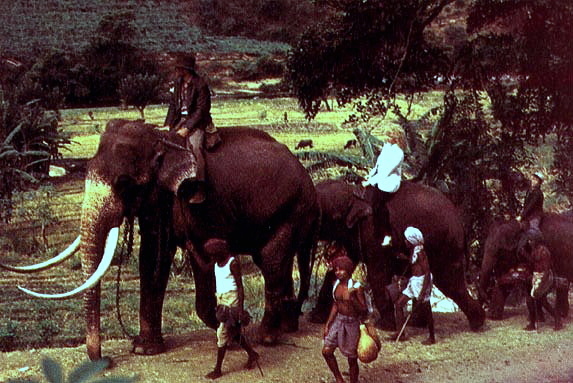 It so happened that in recent years many realistic-looking elephant figures were released by several figurine companies (such as Schleich, Papo, and Bullyland), and there were suggestions that perhaps these elephants were of the same scale as the Indiana Jones figures for them to be compatible. I decided to check out the local stores to see if I can find some elephant figurines to add and complement my awesome Indiana Jones collection. What I found was rather disappointing. Oh there were elephants on display all right, but they were not the type that I was looking for. For some strange reasons, all the elephants I saw were of the African variety, which are totally different from the Indian elephants that appeared in “Temple of Doom”. African elephants are gray in colour, whereas Indian elephants are generally of darker gray, close to black. And Indian elephants have smaller ears than their African cousins. The above photo shows two African elephants figures, and there is a smaller baby Indian elephant figure on the right for comparison. With regards to the figurines’ sizes, the adult elephants are more equivalent to the baby elephants when compared with the 3.75″ Indiana Jones figures, while the baby elephants are of too small a scale for displaying together with the Hasbro figures. A very BIG elephant figure, I am unable to identify the manufacturer of the elephant, which has the word “Imperial” and the year of 1984 inscribed underneath. It’s still an African elephant, but I’ve got no problems with that. And nearly a year after my initial search, one of the local shops finally brought in the Papo Indian Elephant. 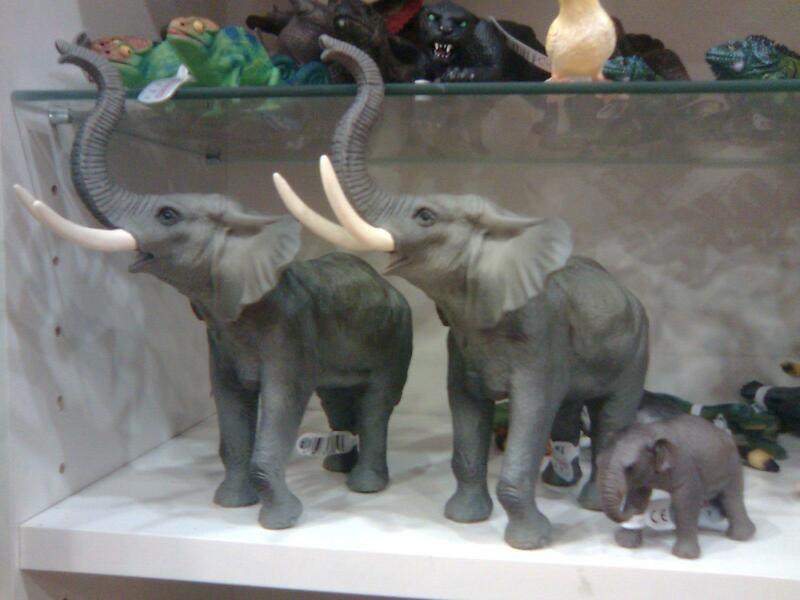 During my Hong Kong trip in December last year, I also found a Schleich Indian Elephant. At last, we can see some size comparison. 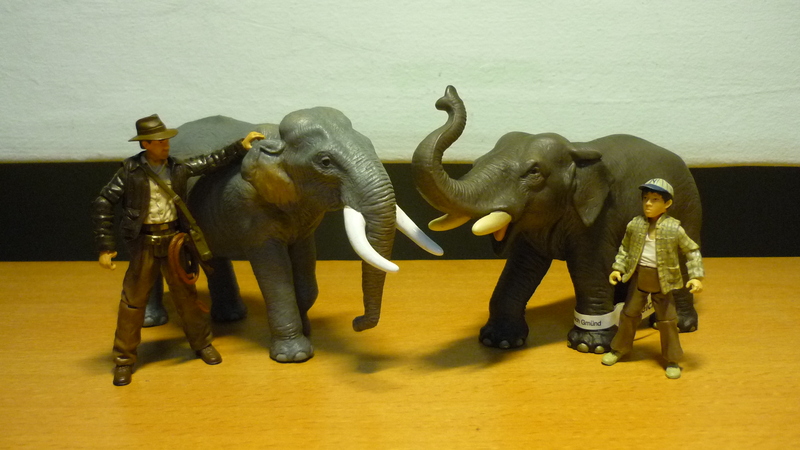 We have Indiana Jones and Shorty with the Papo Indian elephant (left), and the Schleich Indian elephant (right). “Temple of Doom” scene – Journey to Pankot Palace.